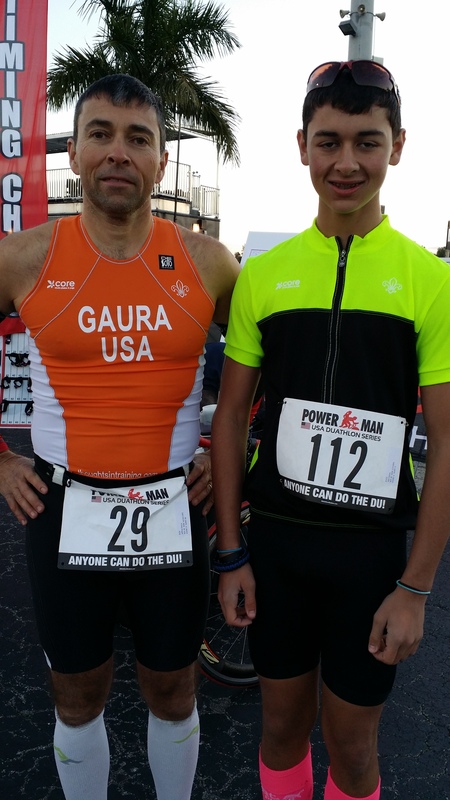 Father and Son, at Powerman, Florida. Lots of sentences start with that. We use that catch all phrase to define themselves. I am an athlete. I am committed. I am contagious. We had weather that begged us to be outdoors today. Blue skies, light breeze and temperatures near 70. It was gorgeous. So, after opening presents as a family and consuming a great brunch, I walked out to the garage and cleaned up the two bikes, then my oldest son and I took a local ride that took us about 45 minutes. After the ride, he went down the driveway while I did a 5k (ish) brick run. Later, my youngest son took off down the driveway to do a tempo run. After all, he, too, is going to Zofingen, Switzerland, to do the Sprint Distance Powerman in September. In any “normal” world, we take days off and enjoy the gift of family and downtime. For us, Christmas was family, downtime and some training. It also meant enjoying some great meals, but without overdoing it. We tracked calories on myfitnesspal and knew when to stop. I will do some Pilates on the floor, some stretching, and Christmas present assembly before going to bed. And tomorrow, life will continue. And we will prepare for the race of our lives, even though it is 8 months away.